You can keep beverage cans or other items cool in the glove box. 1. Turn on the air conditioning. 2. 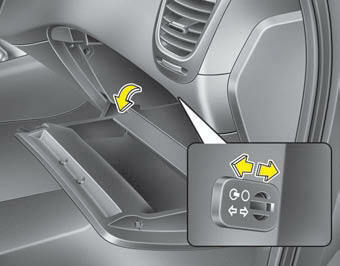 Slide the open/close lever of the vent installed in the glove box to the open position. 3. When the cool box is not used, slide the lever to the closed position. If some items in the cool box block the vent, the cooling effectiveness of the coolbox is reduced. Do not put perishable food in the cool box because it may not maintain the necessary consistent temperature to keep the food fresh. If the temperature control knob is in the warm or hot position, warm or hot air will flow into the glove box.